From Middle Dutch absinthium, from Latin absinthium, from Ancient Greek ἀψίνθιον (apsínthion). In the current spelling from French absinthe. 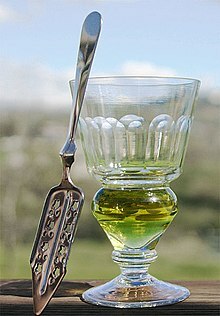 Borrowed from French absinthe, from Ancient Greek αψίνθιον (apsínthion). “absint” in The Bokmål Dictionary. “absint” in The Nynorsk Dictionary.